This striking looking quilt was designed by myself, whilst recovering from a broken foot. With deadlines piling up, I was immensely grateful for the help of a friend, Meg, who happily pieced together the blocks in return for free fabric. At a time when stress was starting to mount, the help of a kind friend was very much appreciated. Hence, the quilt was dubbed Grateful. 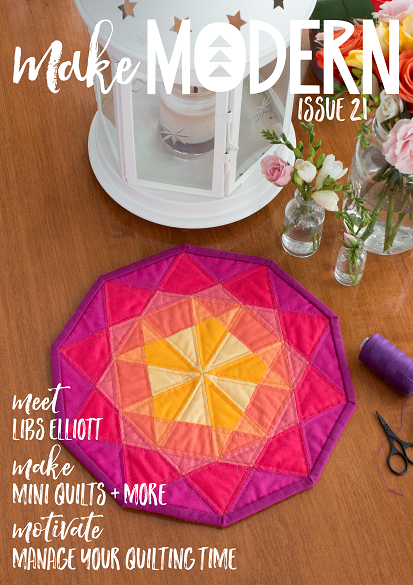 Grateful is a classically striking and simple quilt, with straightforward piecing techniques, and is ideal for using a Jelly Roll (or layer cake) from your stash. The pictured quilt was made using fabrics entirely from Vintage Picnic by Bonnie and Camille for Moda fabrics. The pictured graphic version was designed using prints from Little Ruby by Bonnie and Camille. Create your own quilt in your choice of colours and fabrics, or follow the pictured pretty example. The finished quilt is a generous throw, or a Queen Size at 70" x 87", but can be easily adapted to a larger or smaller quilt, depending on your preference. The quilt is made from 20 large blocks, finishing at 16" square each. The quilt can be made from a Jelly Roll, or a Layer Cake, or scraps from your stash. Extra fabric is required for the background, feature prints, binding and backing etc. 55cm (21”) Navy Stripe print for binding.